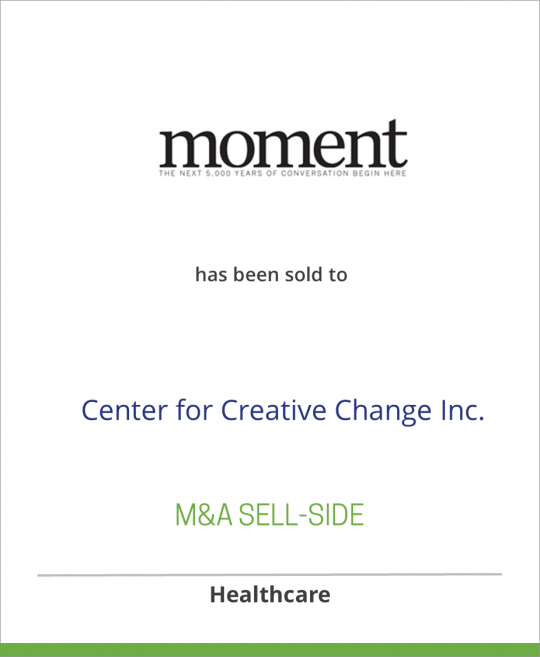 Moment has been sold to Center for Creative Change Inc. Published bimonthly by Jewish Educational Ventures, Inc., Moment is the largest independent Jewish magazine in the U.S., and it has a very distinguished lineage. Founded in 1975 by Nobel Prize winner Elie Wiesel and Leonard Fein, Moment was named after Der Moment, the most important Yiddish daily newspaper in pre-war Warsaw. Since 1987, Moment has been edited by Hershel Shanks, the President of Jewish Educational Ventures. In 2003, Moment received three First Place and two Second Place Rockower Awards for Excellence from the American Jewish Press Association. The magazine is located in Washington, DC. Center for Creative Change Inc. is located in Washington, DC and is managed by Nadine Epstein. To learn more about the magazine, visit the Web site at www.momentmag.com.